"Three of the Sherlock Holmes tales, 'The Speckled Band, ' 'The Red-Headed League, ' and 'The Blue Carbuncle, ' convey an impression of the great man's methods and the diversity of his interests in a brisk and businesslike style." --School Library Journal. Unionist, Doyle ran, unsuccessfully, for Parliament in 1903. During his later years, Doyle became an avowed spiritualist. Doyle sold his first story, "The Mystery of the Sasassa Valley," to Chambers' Journal in 1879. When Doyle published the novel, A Study in Scarlet in 1887, Sherlock Holmes was introduced to an avid public. Doyle is reputed to have used one of his medical professors, Dr. Joseph Bell, as a model for Holmes's character. 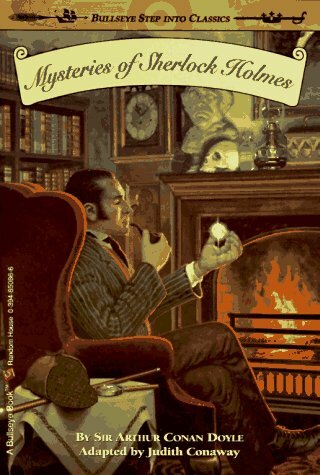 Eventually, Doyle wrote three additional Holmes novels and five collections of Holmes short stories. A brilliant, though somewhat eccentric, detective, Holmes employs scientific methods of observation and deduction to solve the mysteries that he investigates. Although an "amateur" private detective, he is frequently called upon by Scotland Yard for assistance. Holmes's assistant, the faithful Dr. Watson, provides a striking contrast to Holmes's brilliant intellect and, in Doyle's day at least, serves as a character with whom the reader can readily identify. Having tired of Holmes's popularity, Doyle even tried to kill the great detective in "The Final Problem" but was forced by an outraged public to resurrect him in 1903. Although Holmes remained Doyle's most popular literary creation, Doyle wrote prolifically in other genres, including historical adventure, science fiction, and supernatural fiction. Despite Doyle's sometimes careless writing, he was a superb storyteller. His great skill as a popular author lay in his technique of involving readers in his highly entertaining adventures.